Furyk holds a testing 100 footer on the 9th to halve the hole and stop McIlroy and Garcia moving to two up as they prepare to play the back nine. The French-Northern Ireland combo continues to operate like a well-oiled machine as McDowell sinks the birdie putt on the 8th to go five clear. I'm slightly concerned if their dominance continues because I don't have a graphic for 6 up! I have been watching the Ryder Cup and have decided I need to add Scotland to my bucket list. 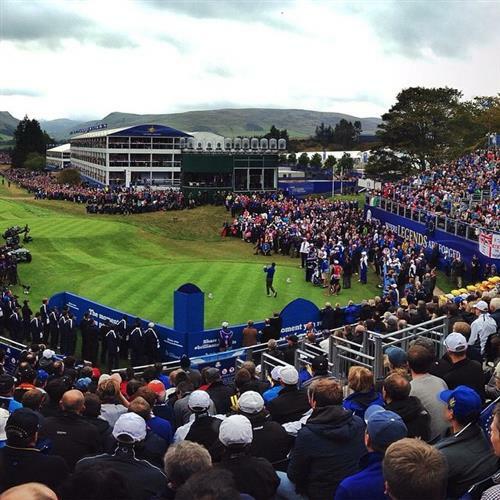 I'm biased yes, but is there a better venue than Gleneagles for a Ryder Cup? Good save from McIlroy on the 10th, knocking in a nerve-inducing four footer to halve the hole. The precarious one hole lead over Furyk and Mahan endures for now. Better news for Europe as Rose sinks a putt on the 12th to peg back the USA tyros Spieth and Reed. The Europeans are just one adrift in this one now. @RyderCupUSA Tom Watson lost the Ryder Cup on the first day by playing Lefty and Keegan in the afternoon session instead of Spieth & Reed. Poor putt from Garcia for birdie on the 11th. It was a golden chance to go two clear but the Spaniard left it short from eight feet and was not a happy bunny with his effort. McDowell and Dubisson complete the front nine five up! Incredible golf from the European pair. Speaking of Dubisson, he's just produced a staggeringly accurate approach on the par three 10th and McDowell's got a gimme for birdie. Donaldson and Westwood escape with a solid two putt on the 15th and with three to play, they're still on a slender one hole advantage. McDowell made birdie on the 10th but so did Fowler for the States and it remains five up to Europe. 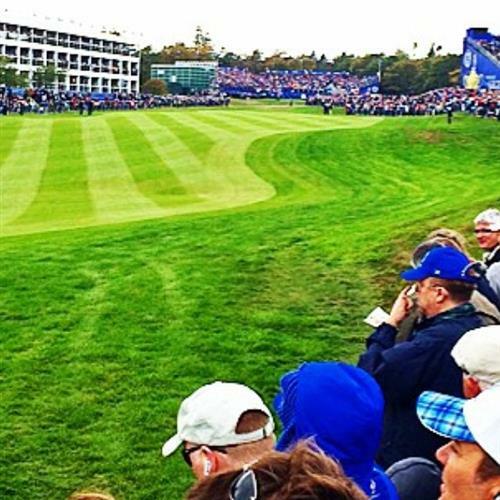 Hello and welcome back to our live coverage of the third and final day of this year's Ryder Cup at Gleneagles. Europe appear to be sitting pretty with a 10-6 lead ahead of today's 12 singles matches, needing a meagre four points to retain the Cup, but hope springs eternal in the sporting world and the USA will be hoping for a Medinah-esque fightback. The 'M' word hangs heavy in the air today as both teams doubtless reflect on what happened at Medinah four years ago. It was 10-6 to the Americans going into the last day then before an implosion of spectacular proportions. Surely the Europeans won't suffer a similar fate today? I'm bloody nervous listening to the Ryder Cup on the radio. God knows what the nerves are like at Gleneagles!!! 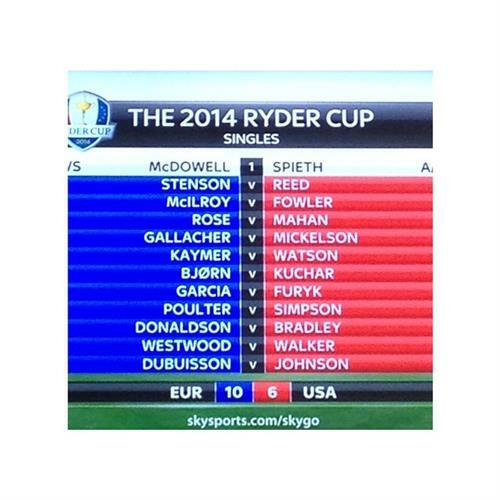 Looks like it's a day of the Ryder Cup then! COME ON EUROPE!! Paul McGinley has decided to send out his big guns out early to get the job asap and nip any potential American charge firmly in the bud. The match of the day has to be McIlroy v Fowler, who Tom Watson will be hoping got a good night's sleep and has recovered from the evident weariness that affected him yesterday afternoon. McDowell smashes his second shot to within eight feet of the pin. Spieth in the bunker protecting the pin and great chance for McDowell to take the first hole. McDowell's birdie putt for the to win the first hole seems destined to drop but rattles the edge and is thrown out. Honours even. 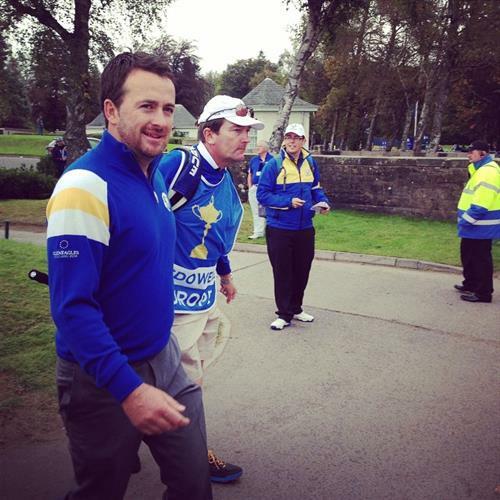 Stenson and Reed are on the first tee. The American is wayward with the driver but Stenson makes no such mistake with his three wood. Spieth shanks it to the right from the second tee but McDowell is OK. The young American looks nervous. Both Stenson and Reed are in the sand with their second shots on the 1st. McIlroy makes his way to the first tee and suffice to say the crowd are rather pleased to see him. Great escape from the bunker from Reed on the 1st and the pressure shifts to Stenson now to halve the hole with a four footer. He's up to the job and they're off to the 2nd as they were. Fowler finds the semi rough on the 1st but McIlroy is long, straight and true. Rose versus Mahan up next. 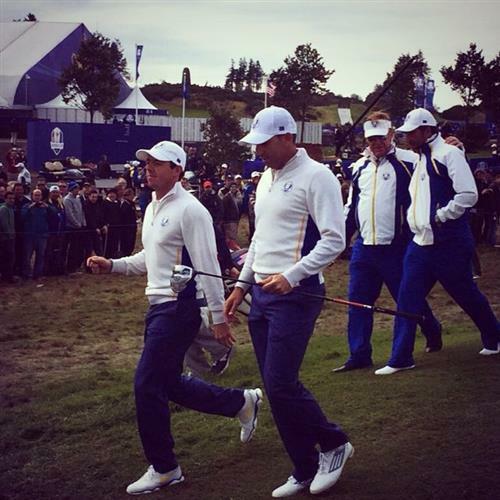 The Englishman has garnered three and a half points from a possible four in the Ryder Cup so far! McIlroy and Fowler both on the green on the 1st, both roughly 10 feet away from the pin. Anyone's hole at the moment. First blood to the States as Spieth birdies the par five four. McDowell can only muster par and the USA have got their noses in front. McIlroy pars the opening hole and Europe are up and running. 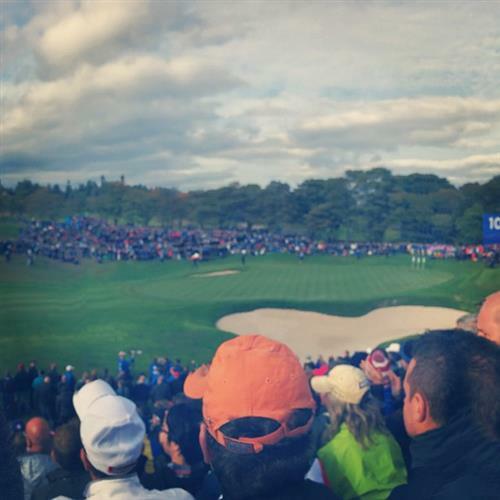 Fowler rather handed it him on a plate by fluffing his third shot but Rory won't care how he builds a lead.